Martha and the Slave Catchers will be published by Seven Stories Press on November 21, 2017. You can order copies now from your favorite on-line stores or directly from Seven Stories at www.sevenstories.com. What are the Facts behind Martha and the Slave Catchers? Martha and the Slave Catchers is a novel from my own imagination. Yet, there are many facts that exist within its pages. I thought it might be interesting for you, my readers, to know about some of the true details in the novel. I have organized them by chapter so that you will be able to find the information you are interested in very easily. Just look for the chapter number below. I have also numbered the information sequentially so that you can readily share it with family, friends, or teachers. 1. You may notice that in the letter from Martha’s father, people’s names are not written out. Instead, there is just an initial followed by a line, such as C_______. This is actually the way that many people wrote names in letters during the 19th century. Perhaps it was a shortcut used to save the author from having to write out so many names, or perhaps it was just a custom of the times. Of course, Martha’s father used the style as a way of protecting his loved ones from the prying eyes of slave catchers. 2. Liberty Falls is not a real place. I made it up. But if you look at the website www.ctfreedomtrail.org (the Connecticut Freedom Trail), you will see two maps. They both show antislavery activity and the Underground Railroad in Connecticut. Look at the upper right hand corner of either map—the Northeast corner of the state. There you will see the towns of Brooklyn and Putnam. Liberty Falls would exist somewhere between these two towns. 3. This chapter begins in October, 1846, when the weather was unusually warm for that time of year. In fact, on October 11, the day that Jake was born, the Great Havana Hurricane of 1846 swept up the East Coast of the U.S., through Connecticut where it did much damage to Hartford, and then on to Boston, Massachusetts. When I first wrote the chapter, I was not aware of this storm, but I decided to check out the weather for that day so I could make the story historically accurate. It was then that I discovered that the warm weather and damaging storm that swept through the area had really happened. What a perfect atmosphere for Jake to enter the world! 4. Martha’s father likes to read The Liberator, an actual antislavery newspaper that existed from January, 1831 to December, 1865. Its editor was William Lloyd Garrison, one of the great antislavery leaders of the nineteenth century. You can see entire copies of The Liberator on-line at www.fair-use.org/the-liberator . 5. The story of Joggy and Lorina appeared in the July, 1835, issue of The Slave’s Friend. You can find the story and a drawing of the two characters at www.merrycoz.org I have included just a tiny part of it here for you to see. You can find many periodicals and stories written for 19th century children on this website. What do you think about the way the girls are described? taken to the Court, and said the children were given to him, and he thought they would be better off here than in Africa. But slavers always talk so. The Judge took the girls away from him, and they were put into the Alms House. As they were getting sick, a kind lady in Broadway sent for them, and they are now at her house. Yesterday I called to see them. They are pretty children—very black—and seem to love each other, though they do not appear to be sisters. They cannot talk as we do. They call themselves Joggy and Lorina. Joggy seems to be about eight years old, and Lorina about six. On board the brig the sailors taught them to swear, and they could say “don’t bother me.” But the kind lady, at whose house they are, is teaching them to speak as we do, to sew, and to do house-work. She says they are neat, learn fast, sing, and run about quite merrily. Capt. Miller will be tried for piracy. 6. The picture I paint of Martha’s family life is based on the real lives of children raised in antislavery homes. (I use the words “abolitionist” and “antislavery” interchangeably so you can get used to them. They mean the same thing when I describe family life.) I did a lot of research into the lives of abolitionist children and wrote about them in Growing Up Abolitionist: The Story of the Garrison Children. It is an adult non-fiction book, but you might find parts of it very interesting, or your parents and teachers might enjoy it. 9. Martha asks her mother if Jake is a slave. Her mother explains that under Connecticut law, Jake is free because he was born in that free state. 10. One of the reasons Jake has trouble sleeping might be that he is lactose intolerant. Lactose is a sugar found in cow’s milk which numbers of people have trouble digesting. Of course, at that time, people did not understand about lactose intolerance, but today we have the opportunity to purchase lactose free milk to avoid the problem. Martha’s father guesses that cow’s milk might be the cause of Jake’s discomfort so has decided to try goat’s milk instead. 11. As a toddler, Jake gets into trouble in a number of ways. It is up to Martha to ensure that he does not get too close to the hearth fire or the outside well, two places where children of the time could be hurt or even meet their deaths. 12. Adam Burke, who owns a General Store, is a “free produce” shopkeeper. This means that he will not sell any product made by the hands of slaves. A number of free produce shopkeepers and tradesmen made less of a profit than those who sold goods made by slaves. 13. Adam Burke gives Martha candy made from honey or local beets, both alternative sources of sugar for abolitionists. The verse on the candy wrapper was an actual verse from the time. 14. All of Becky’s unusual expressions, like “knee-high to a bumblebee,” are true to the 19th century. 15. You might think it strange that Martha’s father attends different churches or none at all, but several abolitionists did just that. They were generally Protestant denominations, but any church was favored if it had antislavery sermons. Some people, like William Lloyd Garrison, believed in anti-Sabbatarianism, which meant that they did not consider Sunday a special day. All days were to be lived in a Christian way. 16. Swing Low, Sweet Chariot is a well-known slave spiritual. In fact, it is purported to be one of Harriet Tubman’s favorites. Some historians refer to the song as being “coded” or as a “code song,” meaning that its lyrics reflected a slave’s desire or plans to run away. There are many versions of the song on You Tube, but I suggest you listen to the one recorded by The Plantation Singers. Below is one version of the traditional lyrics. There are other slightly different ones. 17. Martha and Becky play actual 19th century games. You can find several of them on www.ushist.com/19th-century_toys-and-games.shtml . “Cup and Ball” is described on the top line of the first page. Here is a photo of the cup and ball toy and its packaging. 18. In the 1850s, one-room schoolhouses were still in existence in Connecticut. However, towns and counties were moving toward graded schools as we know them today. I chose to keep a one-room schoolhouse in Liberty Falls so I could show Martha and Jake in the same setting. Martha’s papa’s comments that Jake will get better and his “fits of disobedience will subside” are the words that William Lloyd Garrison used to explain his son George’s poor performance in school. 19. The Fugitive Slave Law of 1850 (or Fugitive Slave Act—it is called both depending on where you read about it) was very real. I have described its stipulations in the story. Below is a thumbnail photo of the law as published in Hartford, Connecticut. 20. “The Law for Catching Men” was the actual title on page 2 of The Liberator of September 27, 1850. The words used by the townspeople gathered outside Adam Burke’s store to discuss the Fugitive Slave Law were exact words used in 1850. 21. The North Star, Charter Oak, and The National Anti-slavery Standard were all antislavery newspapers of the time. Charter Oak was published by the Connecticut Anti-Slavery Society located in Hartford. 22. The items Martha reads about kidnappings came from a booklet published by the American Anti-Slavery Society in 1856 called Anti-Slavery Tracts, No. 18. The Fugitive Slave Law and Its Victims. These were all true stories about real people, many of them children. I changed the dates for two of them for the purposes of my story, but the incidents were still true. You can find this document free on-line at www.archive.org/details/fugitiveslavelaw00mays. 23. The comments that Martha’s father makes about their pet cat were taken directly from the mouth of William Lloyd Garrison as described in my adult book, Growing Up Abolitionist: The Story of the Garrison Children. You can see them on pages 16, 85, and 98 in that book. Garrison loved cats and he loved making puns. 24. You can find any number of ads taken out by slave owners to find runaway slaves. Below are just two examples, but if you search on line for “ads for runaway slaves,” you will find many others. Below is the 1849 ad Eliza Ann Brodess took out for Harriet Tubman, whose name in the ad is “Minty,” short for Araminta, her birth name. It is unclear when she adopted the name “Harriet” to honor her mother but she took “Tubman” upon her 1844 marriage to John Tubman. 25. Antislavery Fairs were annual events held to raise money for the cause. They were very popular with adults and children alike and were definitely places where abolitionist children played games and flirted. 26. The Anti-slavery Alphabet was a popular book for children. Here are two pages that show you the positive image of abolitionist parents and then the very strong negative image of the slave driver. Do you think you would have liked this book when you were a young child? You can find several images from the book on-line. 27. The Windham County Courthouse in Brooklyn, Connecticut, is still standing. Below are two photos of it taken in more recent times. 28. There was a strong anti-Fugitive Slave Law sentiment in Connecticut. This resulted in a more active Underground Railroad and in several judges using Connecticut laws, proposals for new laws, and their own interpretation of laws to ensure that African Americans (whether fugitive slaves or free people) were not sent to the South to be enslaved. In Martha and the Slave Catchers, Judge Jeremiah Mason threatens Robert Dawes with one of these proposed laws. 29. Some abolitionists, such as William Lloyd Garrison, rejected traditional medical treatments of the time, such as using leeches, because they believed they did not cure illnesses. Instead, they tried more adventurous treatments, such as special foods, cold water baths, steam baths, and herbal remedies. Below is a picture of what a leech treatment might look like. Isn’t it horrible? 30. Enactment of the Fugitive Slave Law of 1850 sparked off the work of Vigilance Committees which took assertive, sometimes violent actions to rescue African Americans scheduled to be deported from the North to the South. The cases of Shadrach Minkins in Boston and Jerry in Syracuse are two examples of famous rescues that took place in 1851. (Jerry was actually William Henry, a fugitive who went by the name of “Jerry.”) Below are two photos: one of Shadrach Minkins and one of the Jerry Rescue Monument in Syracuse, New York. 31. Martha asks if Harriet Tubman can be called in to help rescue Jake. Tubman, of course, was one of the most famous of the “slave stealers.” She liberated herself in 1849 but returned to Dorchester County, Maryland, 13 times to rescue at least 70 other enslaved people. Her main objective was to get her family members to freedom, but in the course of this work, she saved many others either by taking them along with her on her journey or providing them with information on how to venture off on their own. I situated my imaginary LaGrange in the area where Tubman had been enslaved and where she often returned. Here is a photo of her taken later in her life, perhaps in 1885. For the most reliable information, go to www.katecliffordlarson.com and click on the Harriet Tubman tab. 32. Becky calls people of Italian descent “infidels” and Native Americans “uncivilized.” Becky is echoing common American racial and religious prejudices of the time. 33. In this chapter, Martha begins to think about what it means to be bi-racial. At the time, many people looked down upon people who had parents and grandparents of different races, religions, or ethnic groups. It was not until more recent times that many people’s attitudes changed. 34. You may find my use of the term “Afric” and “Afric Americans” unusual. Perhaps you thought I left out the letter “a.” Actually, several of the anti-slavery books and stories written at the time use these terms. They were popular and respectful. 36. Martha wonders if the Smiths know Frederick Douglass. Douglass, like Harriet Tubman, came from the Eastern Shore of Maryland, and, like Tubman, he gained his freedom by escaping to the North. Douglass became one of the most famous and honored abolitionist speakers of his time. You can find many books about him. Here is a photo of Douglass as a young man. 37. Robert Dawes’s LaGrange Plantation is a figment of my imagination. But quite by accident I discovered just as Martha and the Slave Catchers went to press that there was a real LaGrange Plantation, also known as the Meredith House, and that it is located in Dorchester County! As you can see from the first photo below, this was a modest house built about 1760. The photo next to it shows the Merry Sherwood Plantation located in Berlin, Maryland. This is more like how I imagined Robert Dawes’s home, complete with a wrap-around porch and many rooms. 39. When Martha and Jake are resting, Martha asks Jake some conundrums. Today, we would call these “riddles.” The conundrums Martha asks came from 1851 and 1852 when William Lloyd Garrison’s eldest son, George, edited his school newspaper, The Diamond. The paper included other conundrums, humorous comments, and news, all with an abolitionist voice. In one issue, the editors reprinted the words to an antislavery version of The Star Spangled Banner written by D.B. Chapman. Here is just one of the stanzas. And proclaims to the world that your liberty’s dying? O’er a land where one-sixth of the people are slaves. You can read more about The Diamond on pages 121-125 in my book, Growing Up Abolitionist. 41. Although I have seen friendly dogs mentioned in a couple of novels about the Underground Railroad, I have never found any real evidence that dogs helped runaway slaves. Rather, I have read that homes that participated in the Underground Railroad often avoided owning dogs as they might frighten the fugitives away from the help they sorely needed. There is much evidence of slave catchers using dogs, often bloodhounds, to track down runaways. This explains Martha and Jake’s fear of them. Here are a couple of images of dogs attacking fugitives while slave catchers look on. 42. 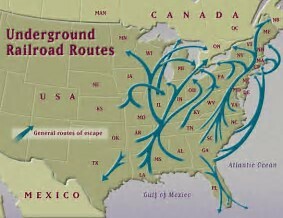 The Underground Railroad used all sorts of transportation to get runaway slaves from one place to another. Peddlers’ wagons or those carrying hay or bricks were not out of the question. I added the milk/cheese wagon. I imagine that could have been used as well. Slave patrols commonly stopped wagons demanding to inspect them for runaways and under the Fugitive Slave Law of 1850, they had the right to do so. Here is an example of what one of these wagons looked like. You can see the hidden compartment. Can you imagine being stuck inside this small space with two or three adults and children for hours at a time? 43. The most famous story of runaway slaves disguising themselves is that of Ellen and William Kraft. In 1848, they openly traveled from Georgia to the North, using public steamers (ships) and trains. Ellen had a very light complexion. She dressed herself up as a white man. In order to hide the fact that she could not read or write, she bandaged her hands as if she had an injury. She also claimed to be ill so she would not have to speak. William acted as her servant. They made it safely to the North but abolitionists there suggested they migrate to England. They did so and did not return to the U.S. until after the Civil War. Below is an image of Ellen Craft in her disguise. 44. I based Martha and Jake’s route north on those of Harriet Tubman and Ann Maria Weems. You can read about Weems’s amazing escape to freedom in Elisa Carbone’s Stealing Freedom. 45. Martha and Jake’s story ends in Aramintaville, Canada. As far as I know, there is no such place. I made it up as a nod to Harriet Tubman whose birth name was Araminta Ross. Tubman led many fugitives to St. Catharines, Ontario, Canada (or Canada West as it was then called) where they developed strong and prosperous communities. This is the general area where I sent Martha and Jake for loving care and safety. Many thanks to Helen Hernandez, Miguel Alonso, and Victor Alonso for their very helpful comments and suggestions for this web content.